Synthetic peptide corresponding to Human Alpha B Crystallin aa 44-54. Immunofluorescence staining of phospho-alpha-B crystallin (Ser45) in U373 MG cells results in cytoplasmic staining. Our Abpromise guarantee covers the use of ab5598 in the following tested applications. 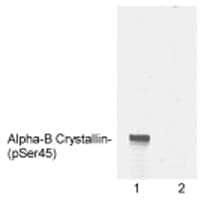 Western blot of recombinant bovine phospho-alpha-B crystallin (Ser45) using ab5598. Lane 1 is phospho-alpha-B crystallin (Ser45) and lane 2 is unphosphorylated alpha-B crystallin. Publishing research using ab5598? Please let us know so that we can cite the reference in this datasheet. Dear sirs, our lab is currently using phospho alphaB-crystallin Abs but we are seriously considering to switch to different ones. Since we plan to spend a lot of money in these and other Abs, I would like to know if there could be any possibility to test the aB polyclonal Abs (total and 19/45/59 phosphorylated forms) before placing an order.